Some 4,000 people packed a section of Conte Forum for the University's second annual freshman convocation on September 16, and only 2,300 were freshmen. The remainder, from other classes and the public, overflowed into stairways and concourses to hear the night's speaker, U.S. 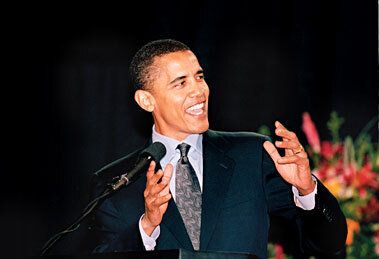 Senator Barack Obama (D-Ill.). Prior to the speech, members of the Class of 2009, grouped by dormitory (each led by a torchbearer) and in semiformal dress, processed from Gasson Hall to Conte Forum. Obama spoke in a paced baritone on privatization, Hurricane Katrina, and his life. Freshmen had received his 1995 memoir, Dreams from My Father: A Story of Race and Inheritance, during summer orientation. Obama's talk can be heard at www.bc.edu/frontrow.